Time-Saving Bathroom Cleaning Tips and Hacks. We all love (and expect) a clean bathroom, but few people like cleaning the bathroom. From water and other wet messes to hair and soap scum, the bathroom is pretty dirty for a place we go to get clean. But you don’t have to spend a lot of time (or energy) to keep your bathrooms clean! 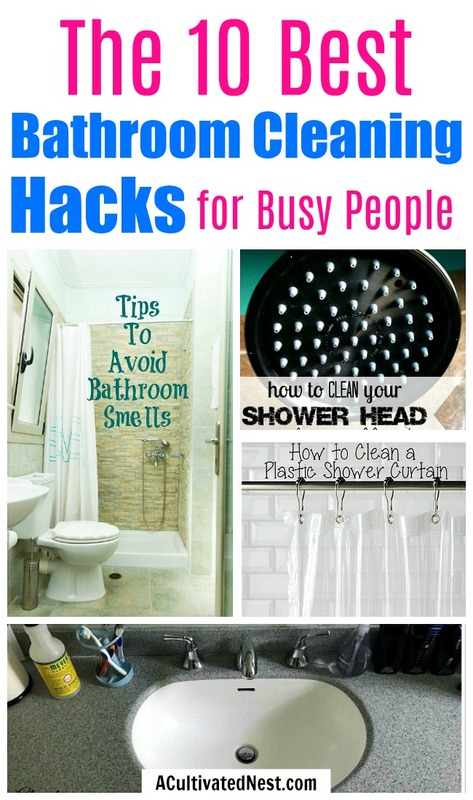 Even the busiest mom can get her bathrooms sparkling in no time with these 10 Best Bathroom Cleaning Hacks for Busy People! 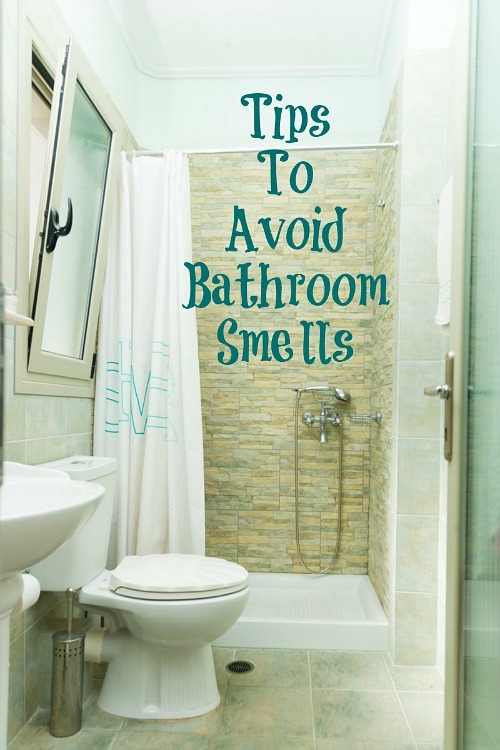 Cleaning your bathroom shouldn’t be a cause of stress. Simplify and streamline the job with these 10 awesome bathroom cleaning hacks! 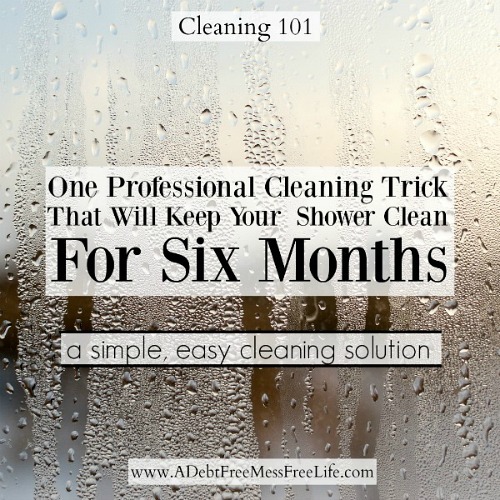 A Debt Free Stress-Free Life has a genius shower cleaning hack that will keep your shower clean for six whole months! What would you do with all that extra time? Bathrooms are stinky! Check out Cook Eat Go’s bathroom cleaning tips for making sure her bathroom always smells as fresh as a daisy! 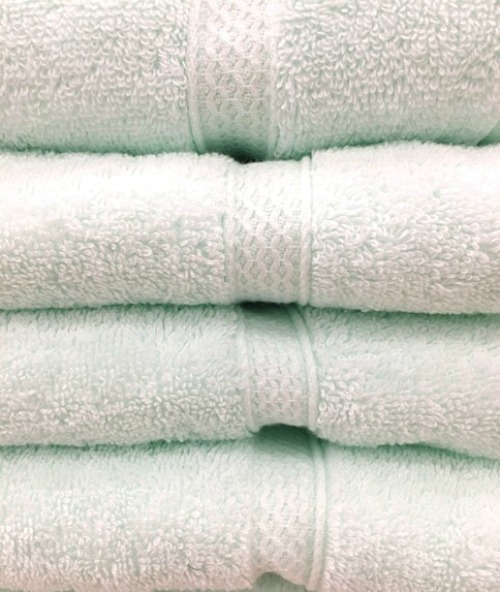 How frequently do you need to change your bathroom towels? Kimberly Button, a certified Well AP, tells us that it may not be as often as you think depending on the design of your towel bar! If you have a plastic shower curtain, you may wonder how you can clean it without taking it down and scrubbing it by hand. Luckily there is an easier way! 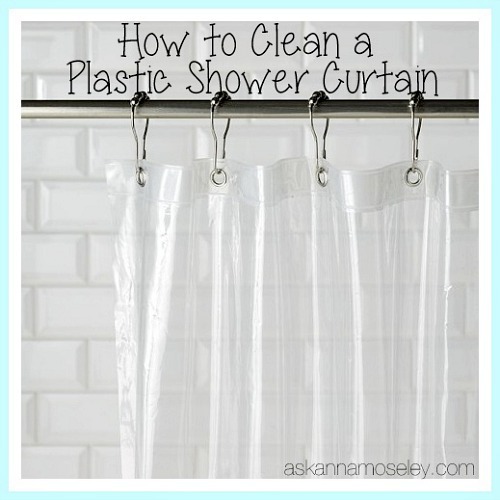 For a quick shower curtain cleaning hack, check out Ask Anna’s handy tip! Yup! You read that right! 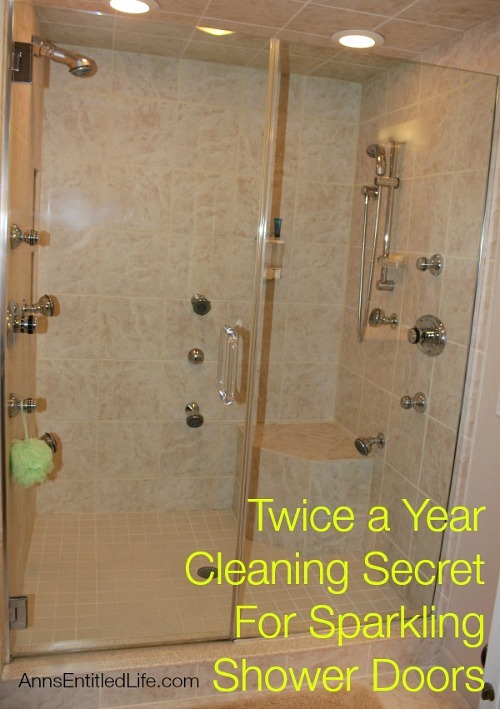 Ann from Ann’s Entitled Life has a shower door cleaning tip so great you will only have to use it twice a year! That’s a bathroom cleaning hack worth marking on the calendar. 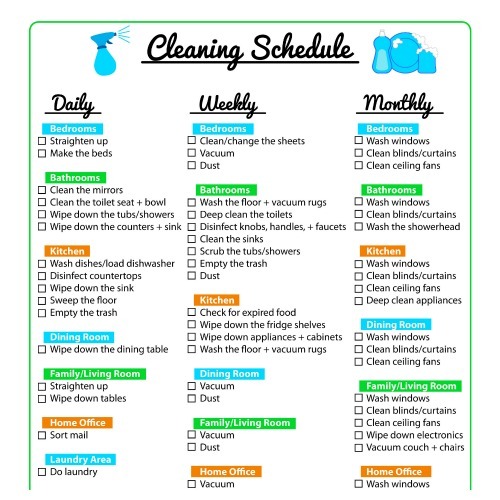 Sometimes all you need is a schedule to help you maximize your time and be more efficient when it comes to cleaning. An easy way to do that is with our free printable cleaning schedule! Sediment can build up in your shower head and block the openings causing reduced water flow. 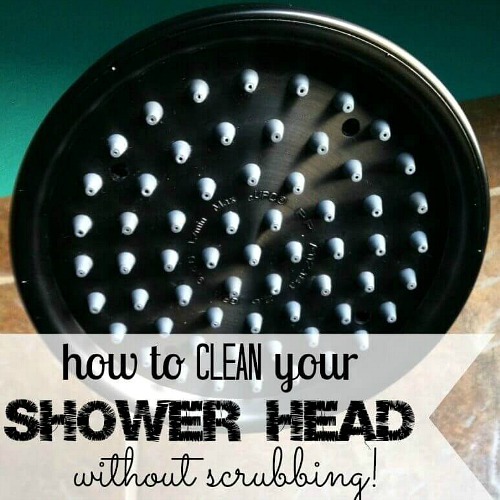 Cleaning your shower head without scrubbing is easy with this simple cleaning trick from One Crazy Mom. Black mold isn’t just unsightly; it can be hazardous to your health. 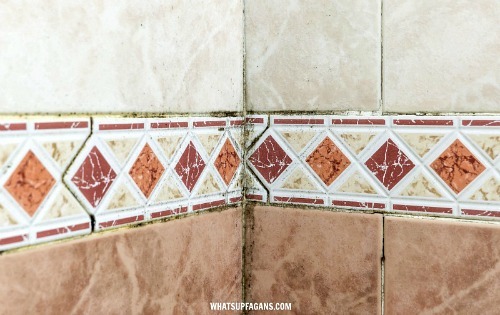 What’s Up Fagans has several quick and easy tips for removing black mold from your entire bathroom. 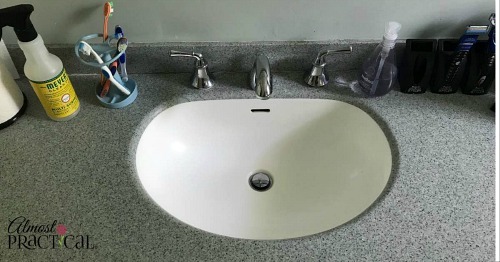 Whether you all share a bathroom or the kids have their own, this one simple change from Almost Practical might just save your sanity and keep your bathroom counter sparkling fresh. Or at least clean it with minimal effort! 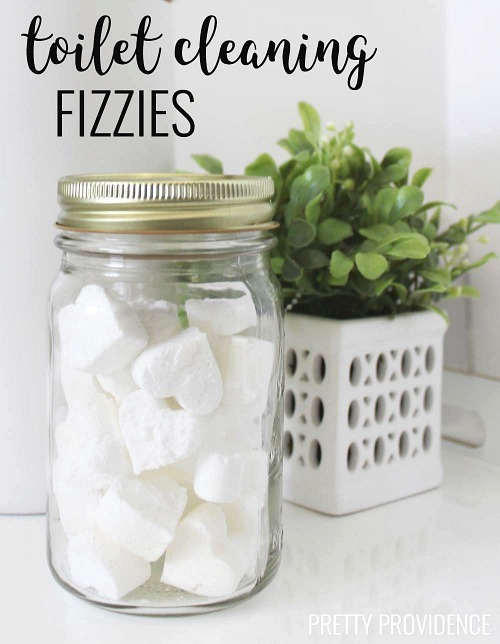 Mix up a batch of these super simple DIY toilet fizzies from Pretty Providence and just drop one in the toilet when it needs freshening. While you don’t have to enjoy cleaning your bathroom, it doesn’t have to be a difficult task when you have bathroom cleaning hacks like these. Do you have a great bathroom cleaning hack that we didn’t share? Tell us in the comments! « 10 Cute Spring Printables That Are Free! 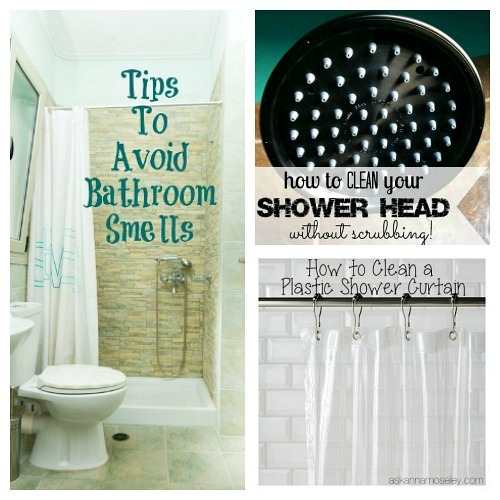 These are all such great tips for keeping the bathroom neat and tidy. Thanks so much for including mine!